I’m not making this up. I went surfing about to see what I could find in the fractal world and lo and behold at Flickr, a couple of pages into a search on the term “fractal”, I saw wires, boards and strange, curly burn patterns. Here’s another example, with more colorful commentary. 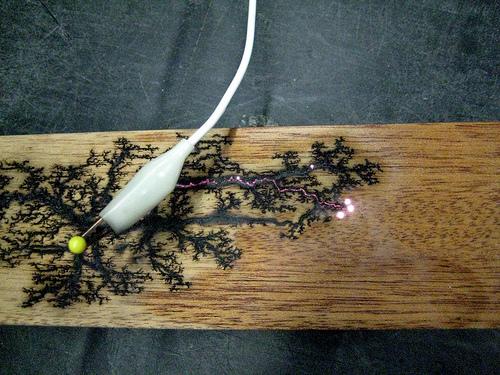 The YouTube description for it says “Jerry Rutherford of Robomo during a build session showing us a technique of using a neon sign transformer to create patterns of conductivity across a board.” Among other things, the video is tagged “fractal”. If I heard correctly, in the video Jerry Rutherford says “Sometimes you get ugly… and sometimes you get these really cool patterns”. Doesn’t that sum up this whole fractal art thing?